Well it's congrats to Isobel for correctly identifying the tree in the previous post about the Botanic Gardens as being a Pohutekawa tree. 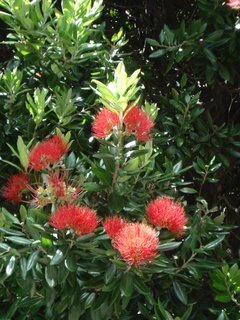 Or more commonly known as the New Zealand Christmas Tree. Here is a close up of the flowers as requested by my sister. Unfortunately I thought it was a Feijoa tree so it actually doesn't fruit as I suggested previously. Considering my mother is a Horticulturist, my sister is a Horticulturist, my brother is a Landscape Architect completing a Doctorate in Forestry and the fact that I was brought up on a Nursery I think I have no real excuse for this oversight bar an extreme casualness when it comes to this blogging thing. 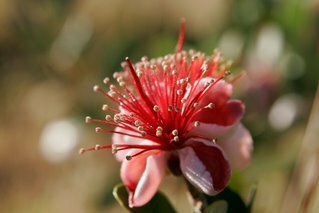 Anyway for the record here is a picture of a Feijoa flower, and I beleive this fruits in the Autumn. Its a pity the New Zealand Tree doesn't grow Feijoas as apparently they are very tasty. Given my background perhaps I could create a new hybrid. Number three is ironic really as this is the third time I will have tried to learn how to swim. The first time was as a kid when I had to get “grommets” in my ears which meant I had to give it up. Eventually I went back as a mature student to Rathmines swimming pool. I was something of an oddity, having the ability to empty the contents of the pool while remaining perfectly stationary. I would kick out from the side of the pool with my pale blue float and slowly come to a complete stop as the friction of the water won the fight against my momentum. I would then lie in the water in an inverted dead mans float and watch everybody else sail on by. Anyway once more into the brink, as I begin my adventure and probably baffle another swimming community.